As was always the case, the main function of any universal remote you can possibly get your hands on is to control all or some of the larger electronics in your home. Often times, such remotes can work on stereos, TVs, Playstations, Xboxes, Wiis, satellite receivers and a wide variety of other consumer electronics which are typically found in the average western household. If you’re merely looking for a universal remote as a means to control all of these electronics, any old remote will likely work just fine. However, there are many features in universal remotes which aim to streamline recreation in every possible way. For example, many universal remotes in this day and age now come with LCD screens and touchscreens. Said screens allow you to undertake more advanced operations when controlling electronic devices of your choosing, though whether or not a device is compatible with more advanced controls all comes down to the device in question. This is true for a whole lot of the fancier, more modern features found in today’s remotes. This being the case, whether or not any given remote will work for you will vary greatly based upon how you plan on using the remote and what you plan to use it on. Looking for that perfect universal remote to control a multitude of devices? We got you covered as we reviewed dozens of the leading remotes. 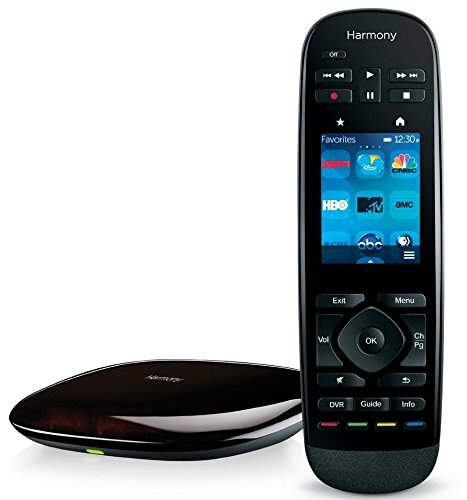 The Logitech Harmony is one of the more advanced universal remotes currently available on the market. It has a sleek, black, rounded design which is sure to look good on whichever table you may have it sit on. The first thing you’ll likely notice about the remote; however, is its relatively large screen which sits right in the middle of the unit. The screen serves a few different purposes which aim to make your life easier through offering you the ability to take on more advanced controls. You’ll be able to control up to fifteen different devices through your remote, including TVs and game consoles. Should a time arise where you’d like to control a device which you haven’t yet calibrated to your remote, you’ll be able to replace one device with another. It also comes with a proprietary smartphone app which allows you to use your smartphones and tablets as remotes. Lastly, the remote has a few memory-oriented features which allow you to save favorite channels and enable other one-touch actions for easy, future use. 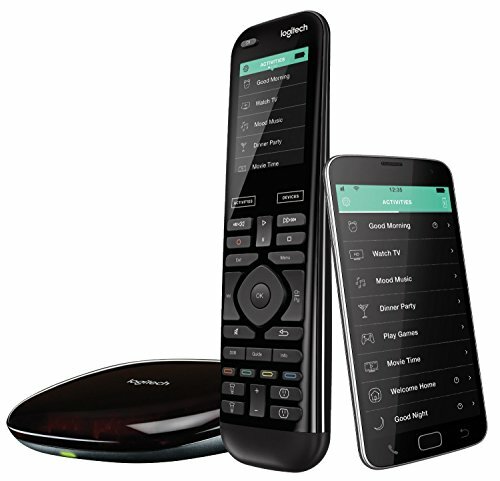 If you simply want it all in your universal remote and don’t mind spending an hour setting it up out of the box for the privilege, the Logitech Harmony is an excellent choice. Similar to the Harmony Ultimate, the Harmony Elite is easily one of the most advanced pieces of technology within the universal remote sector. This is immediately apparent when you first look at the unit and notice its screen. As is the case with the Harmony Ultimate, the Harmony Elite comes in a very sleek design. While perhaps not the most important feature to look for in a universal remote, it’s certainly nice to have something look great when it’s lying out in the open on your coffee table all day. Once again, you’ll be able to control up to fifteen devices simultaneously with your new Logitech remote. A proprietary technology known as the Harmony Hub allows you to control any piece of technology in your home, even those hiding behind walls or cabinets. All in all, you’ll love the Harmony Elite if you want the very best that the world of universal remotes has to offer in terms of technological advancement. Perhaps you’re a fan of the Logitech Harmony series but find yourself wanting something a little cheaper in your next universal remote purchase? If so, the 650 Infrared is likely just the remote for you. It comes with the same sleek look and some of the convenient features found in other Logitech Harmony remotes, though it isn’t nearly as technologically advanced. You could almost consider the 650 Infrared as being the Logitech Harmony Lite. It comes with a screen in the middle (although it may be somewhat small in size) which allows for easy comprehension of just what it is you’re doing on your remote at any time. This ensures there are no mix-ups in its use. The remote comes with a variety of one-touch capabilities, such as the ability to watch a DVD with the push of a single button. You’ll also be able to choose favorite channels with your remote, which will all be saved for easy viewing through the remote’s screen during a later time. While it may not be the very most advanced remote on the market, you’ll likely appreciate it a great deal if you’re the type to opt for products with an excellent price-to-quality ratio. All of the above three remotes will work equally well in terms of their ability to allow you to seamlessly control your electronics. They can all send signals through walls (for lack of a better term) and can all control several different devices simultaneously. As such, picking the right remote truly all comes down to whether or not you’d like to see any advanced features in you’re remote and, if so, which of those specific features you’d like to see. Each remote has a few little features which are exclusive from others in the line. It is these features which will ultimately lead to one being more suited toward you than the other. Each of the remotes has its own screen, which is a feature I particularly like and is one which is consistent throughout the entire line. It’s not that screens are an unusual feature in universal remotes in modern times (actually, they’re becoming quite common), it’s that the screens in question truly seem like they’ve been placed there for practical purposes, as opposed to simply acting as a way to make the remote look more high-tech so the company can mark up the price. What is an Universal Remote? If you haven’t purchased a universal remote in the last two or three years, you may actually be quite surprised to see how far the technology as a whole has come over a relatively short span of time. Unlike several years ago, where buying a universal remote was a simple process (because, let’s be honest, they were all the exact same), the rate at which any given universal remote varies from the next is actually quite huge. Depending on the particular unit you get, the end result may resemble a cheap stereo remote, an expensive smartphone or anywhere in between. As such, while picking out a universal remote is still a very easy process, picking out the right universal remote has become a bit more challenging than it once was. Each remote has its own set of features and capabilities which can make your life much easier or much more difficult, with the result depending entirely on what type of user you are and whether or not you have the right remote for you. Let’s take a closer look at how to find the best universal remote for your needs. Of course, you needn’t feel limited to the above list when picking out your new universal remote. While the above three units are my personal favorite and are products which I would consider the best in their sector overall, there’s no doubt that your particular needs may be very different than mine. With that said, let’s look at how to cater to those needs through your next universal remote purchase. Here are some things to look out for while shopping. How many devices will you be controlling? While it can’t hurt to have a couple of extra control slots available on your new universal remote, you probably shouldn’t get a unit with twenty different slots if you only have three different devices, as you can be sure the price has been marked up to at least some degree on account of those extra slots. There’s no need paying for features you’re not going to use. Are your devices in hard-to-reach areas? The Logitech Harmony series isn’t the only line of universal remotes which can reach electronics from behind cabinets. If you often have trouble getting your current remote to pick up on devices, your next remote will likely be no different unless you purchase one with such a feature. What do you plan on using your remote for in the first place? If all you plan on using your universal remote for is to control electronics by turning them off and on or by changing channels on your TV, it’s worth noting that a remote higher in price does not translate to a remote higher in quality. For those who just want basic controls, an LCD screen or touchscreen will prove to be a large and unnecessary money pit. It’s important to realize just how much these advanced features mark up a product’s price. If you’re not going to use them, you’d do well to stay away from remotes which feature them. Perhaps you’re looking for a top-of-the-line universal remote but don’t know just what kind of features are out there to be had? Let’s take a look at some of the technology you can expect to find in your search. The Ability to Send Signals Through Walls – The Logitech Harmony remotes we touched base on earlier are a great example of this. If you have large amounts of electronics scattered about the house and throughout different rooms, you will likely appreciate this feature. Smart Home Capabilities – Although it may not be known to most folks, you can actually get remotes which can control appliances throughout your home. With such a universal remote, you’ll be able to turn on your TV and dim your lights at the same time. A Mix of Buttons and Touchscreen Functions – Through the use of two different control panels of sorts, all of your remote’s functions will be split into two different areas. This makes using it much easier due to the level of organization inherent in such a feature. While some of the above features can be great specifically for those who feel they could make use of them, they may not always be suitable for everybody. However, there are several features you can benefit from no matter who you are. As such, it can’t hurt to keep an eye out for them in your next purchase. Here are those features. Large-Scale Compatibility – Believe it or not, a large variety of universal remotes aren’t actually all that universal. Check with the manufacturer to see whether or not the remote you have your sights set on will actually work with all of your devices. The Ability to Reach All Objects Within Your Home – Even if you don’t need a remote which can control electronic devices through walls, you certainly need something which can reach your devices, whether they be across the coffee table or down the hall. Take note of which devices you’d like to control and take a look at a remote’s range before finalizing your purchase. You might be able to walk away with more control over your house than you thought possible. A universal remote can be a tool to use your TV and Playstation efficiently, or it can be a control panel for your entire house. Of course, this all comes down to the type of remote you decide to purchase. Before buying a remote, try taking a look at just how many different devices it can control; you may end up getting much more than you bargained for (in a good way). Universal remotes have come a long way in the last couple years. What was once a neat little tool to reduce the need to get off of the couch can now save you minutes or hours a week. Anything is possible. It all comes down to just what it is you’d like to control in the first place.